The discussion of value of a particular narrative too often misidentifies rhetoric or realism as the sole factor placing a text at a high (or the highest) level of quality; realism, in particular, has this false association with narrative purity, and rhetoric in narrative has the mistaken association of intellectual engagement as a necessary component of artistic value. This is a narrow perspective born from the notion that rationality has a greater value than emotional/visceral reaction. A more significant problem with this perspective is that it displaces value from the text or the work of art itself. The text has no intrinsic value, only its capacity to represent something else: so-called reality, a philosophical concept, a social condition, a sociological perspective, etc. This is the aesthetic problem of subordination which art in the twentieth century strove to and should have eliminated. William Carlos Williams and the Abstract Expressionists should have, finally and completely, highlighted the falsity in the notion that subordination is superior to aesthetic purity. Alas, critics seem resistant to accepting what Williams should have taught the world, slow to accept that thousands of years of traditional Western concepts of artistic value have been upside down this whole time (something that Eastern concepts of artistic value have acknowledged for just as long). This is partly because there are so few systematic ways to analyze a text given the elimination of subordination. Understandably. How do you rationally analyze something that is at its core irrational? When writers say (as so many writers do) that they have no rational purpose or intention in writing a narrative other than to explore a character’s tapestry of emotions, how then do critics take that irrational but perfectly valid claim and honor it without forcing rational analysis in places it doesn’t necessarily belong? 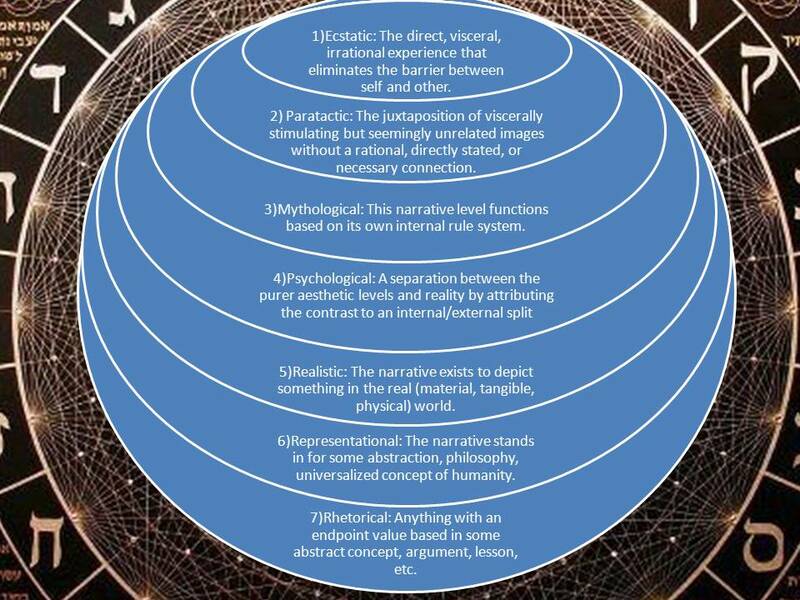 This is why I keep attempting to make something systematic, hence the Seven Levels of Narrative Subordination. A more effective way to approach a work of art which has greater potential to give the irrational core its due weight is to look at the various levels on the spectrum between aesthetic purity and subordination. Considering this as a spectrum better highlights the value at both ends (since critical analysis has been stuck at one of the spectrum for too long). By “aesthetic purity,” I just mean acknowledging the text based on its own value without subordinating the value to something outside of it. The most aesthetically pure is the least subordinated; the most subordinated is the most rational/cerebral but also furthest removed from its aesthetic core, that which gives it stimulant (visceral/emotional) value. A spectrum, however, is not the most accurate way to consider these levels since each element in the scale builds on the next, so a work of art must start with that pure, irrational core as a condition of being a work of art. Thus, one could argue the higher levels have greater value in their relative complexity. What I have identified as the “Rhetorical” level, the highest level of subordination, most likely contains the other six levels as well, thus allowing the possibility of argument for the superiority of this type of text. However, as this level is farthest removed from the aesthetic core, it is least likely to be enjoyable, beautiful, viscerally stimulating, etc. Also, this complexity is not a necessary condition of the Rhetorical level, and containing each of the previous six levels is likewise not a necessary condition. For example, most children’s narratives are Rhetorical without necessarily being complex and without necessarily containing all seven levels within them. Also, to clarify, I focus on levels narrative subordination particularly because the first two levels (“Ecstatic” and “Paratactic”) work well with any type of art, but the other five apply best to narrative. For example, considering the rule systems relevant to each level is a way to understand its level of subordination, a consideration that is less helpful for non-narrative art. As a more specific example, the “Mythological” level functions based on its own internal rule system, a concept that is very useful in understanding narratives but not as useful in understanding visual art. Rule systems in narratives are an important aesthetic consideration since violation of a perceived rule system may seem like a flaw. To say this is an intrinsic or universal flaw is false, but it is important for a writer to recognize that the reader is likely to perceive this as a flaw. For example, a story on the Mythological level may include imaginary creatures who must adhere to an internal rule system without necessarily adhering to the rules of the so-called real world. A violation of this internal rule system may seem like a flaw no matter how beautiful the text may be at its core. Likewise, what I identify as a Rhetorical story must adhere consistently to the premises of the argument, and failure to do so may seem like a flaw even if the story itself is beautiful and adheres to internal rules irrelevant to the argument. 1)Ecstatic: The direct, visceral, irrational experience that eliminates the barrier between self and other. Rule System: No rule system. Subordination: No distance between the work itself and the experience of the reader/viewer. Analytical strategy: As this is the most irrational level based purely on individual experience, the easiest element to access and analyze is individual emotional/visceral reaction. In brief: As the narrative or artistic experience requires the elimination of the barrier between self and other, this is the most basic and purest level of an artwork or narrative, and each subsequent level must contain this at its core. This level could be called “Absurd” as absurd narratives are the most characteristic examples and least likely to contain one of the other levels as well, and it’s provocative to say that all narratives must be absurd at their core, but that word contains so much baggage it may be counter-productive. Most philosophical treatments of absurdity as a concept are Rhetorical in nature, not truly and purely absurd. The Ecstatic level is the level of pure artistic absurdity where philosophy is irrelevant and unnecessary (in other words, absurdity certainly isn’t a problem to be solved). To clarify, narratives or artistic works can function on other levels, and often with more purely absurd texts critics attempt to impose order and meaning on them (the need to impose unnecessary order and meaning on things is a common and often intense desire); however, since absurdity/ecstasy is at the core of all successful narratives and art works, meaning and order are more incidental factors than necessary components. There is resistance to recognizing this as the core of all art, arguably, for two reasons: 1) artifice appears impure; 2) pleasure for its own sake engenders discomfort and seems like a frivolous, indulgent, gratuitous, or self-serving moral violation. The answer to both of these objections/misconceptions is in the nature of ecstatic engagement: it eliminates the barrier between self and other. It is artifice (and all art is artifice to a degree) only in that it has no necessary relationship with physical reality and exists primarily in the interaction between self and other free of barriers. Tangible/physical/material reality is only more pure than this if you believe science is the only authentic mechanism for discovering truth. That is a valid position to hold, but it is hardly helpful in creating or understanding art. This connects likewise with the notion that ecstasy is mere frivolity or self-pleasing immorality, but empathy (elimination of the barrier between self and other) should be the root of morality, arguably, and is the root of morality in many religions, from the “Love your neighbor as yourself” of Jesus to the compassionate non-duality of Buddha. To feel the pain and joy of another can only be immoral frivolity if your moral system is devoid of empathy as an essential component. Again, this is a valid position but hardly relevant to art. Favorite Examples: Incidences by Daniil Kharms, Amedée by Eugene Ionesco, “Sorrows of a Family Man” by Franz Kafka, etc. Frank O’Hara’s “Personism: A Manifesto” is essential reading in understanding the one-to-one interaction of the ecstatic text and the irrelevance of universality. 2)Paratactic: The juxtaposition of viscerally stimulating but seemingly unrelated images without a rational, directly stated, or necessary connection. Subordination: No element is necessarily subordinated to another, by definition, but images can relate to elements or concepts outside of the text itself. Analytical strategy: Determine the images that create a visceral response in juxtaposition. Do not look for a rational connection but a purely irrational resonance. If you find a rational connection, especially where one element is subordinated to the other, this likely qualifies as the Representational level and muddies the aesthetic purity with overt rationality. In brief: The line between the Ecstatic and Paratactic level are blurred since both levels function quite similarly. However, the Paratactic differentiates from the Ecstatic in that images can relate to concepts or a so-called reality outside of the text. For example, a William Carlos Williams poem might relate a “red wheelbarrow” and “white chickens” without stating how they connect (a classic, basic example of parataxis), but understanding of this parataxis might relate to the reader’s own experience or concept of farming or poverty without necessarily subordinating the images to the concepts or experiences. The text, however, becomes one step away from the pure ecstatic experience in this outward-stretching web. Another example: a text might contain multiple blue objects, and the reader may yearn to find some rational connection between these blue objects. However, the yearning for connection (a type of visceral stimulation vital for this level) is far more important than an actual, rational connection, and the reader may think of traditional associations of blue and the Virgin Mary without necessarily subordinating the text to Christian concepts. In other words, the color blue does not necessarily make the text about (“about” generally implying a level of subordination) the Virgin Mary or Christianity simply because of the presence of blue, but this irrational connection could add visceral value to the text. If the weight of history aids in arguing the importance of parataxis, subordinating a text to abstractions may be the traditional Western way of understanding a narrative (thus the taken-for-granted superior position), but parataxis is the traditional Eastern way of understanding imagery in multiple art forms. 3)Mythological: This narrative level functions based on its own internal rule system. Rule system: Internal rule system set by the author, genre, narrative conventions, etc. Subordination: A concept of order is grafted on the irrational/visceral elements of the text, but this rule system is essentially arbitrary; it may relate to rule systems in reality/outside of the text, but this is not necessary. Analytical strategy: Identify the internal rule system and how the text fulfills or violates this rule system; recognize the relationship between the imposed order and the irrational, visceral core. For example, if a character has imposed a system of order on the absurd universe, does he/she violate this imposed order, or does the universe violate/fulfill this order in some way? In brief: I call this level “mythological,” not because it has a relationship to myth criticism (as most of that sort of criticism functions on the Representational or Rhetorical level) or any narrative identified as myth (which is only one of many other types of stories on the Mythological level) but because it comes from the same impulse as myth making: to impose order on the disorderly whether or not that order has any rational relationship with scientifically measurable reality. Myths, likewise, must conform only to their own ordered system and not necessarily to any system outside of themselves. I would go further and say most narratives, by the nature of being a narrative, are intrinsically mythological if they have any sense of order or conform to any rule system. The most obvious place to see this is in so-called “genre” fiction – a vampire story follows the well-established vampire rules or sets its own but follows those consistently. However, internal rule systems are as relevant to a so-called “literary” work as they are to a so-called “genre” work. The terms “literary” and “genre” are grossly inaccurate and sloppily applied in most cases, but considering their relationship with internal rule systems clarifies their basic difference more accurately: a “genre” work conforms to rule systems within its own type and a “literary” work establishes its own, supposedly (and a “literary” work becomes “genre” when it follows the rule system established by the “literary” type). However, the most egregiously applied term associated with this level is “escapism” – escapism is indeed one of the effects of works which remain more purely within the Mythological level, but this one effect is hardly its most significant value. “Escapism,” especially in its pejorative sense, inverts the value system placing so-called reality above the narrative experience. The narrative experience can as easily be considered a greater level of reality. The relationship between the mythological and the realistic level is incidental – so-called reality fills in the gaps left by mythology but is far from a necessary condition of mythology. 4)Psychological: A separation between the purer aesthetic levels and reality by attributing the contrast to an internal/external split. Rule system: Two separate rule systems, internal and external. The internal rule system may function the same as the Ecstatic, Paratactic, or Mythological level, but the subordination implies that the external rule system functions the same as the Realistic level. Subordination: The non-realistic or seemingly disorderly elements are subordinated to external reality because they are attributed to psychological reflections of external factors. Analytical strategy: Identify the internal and external elements in the story and determine how one reflects the other; for example, how does a non-real element reflect some more realistic element within a character’s world or something psychologically significant to the character? In brief: This is the transition between irrational and rational levels because it acknowledges the value of both sides. However, this dilutes the aesthetic power of the Ecstatic core because it is subordinated to so-called reality. This is not necessarily limited to psychoanalytical criticism or rules of psychology, psychoanalysis, etc. though this can be enlightening method for approaching texts on this level. Most forms of criticism hover in the Representational level, but the Psychological level can resonate in both directions as long as it remains rooted in this two-level contrast between internal and external forces. For example, elements can function by internal rules, thus making it a Mythological narrative, but function simultaneously on the Representational level if elements stand in for abstract concepts. If this resonance takes place on two levels – for example, Mythological elements take place inside a character’s mind while Representational elements are outside of the character’s mind – and the internal elements are subordinate to the external elements, this narrative exists on the Psychological level. 5)Realistic: The narrative exists to depict something in the real (material, tangible, physical) world. Rule system: The narrative must follow the rules of the scientifically measurable, so-called real world. Subordination: The narrative is subordinated to the real world outside of it. Analytical strategy: Focus on the accuracy of the narrative within the context of the real world. For example, an element inaccurate to material existence, scientifically established rule systems, or social conventions becomes a flaw. In brief: While works within the genre called “Realism” are often depicted as purer forms for their elimination of imaginative elements, they are aesthetically impure because of their dependence on a material, tangible, physical reality outside of the texts. Any consideration of the text’s basis in reality displaces value from the text and places value in elements only incidental to the text’s core Ecstatic value. This is not applicable only to texts based on real events or texts in which events are depicted as being real. More important at this level is recognition of a narrative as being dependent on reality and valuation of the accuracy of this depiction of reality. However, if a text functions to reflect some universal concept (like the “human condition,” etc.) or has non-realistic elements which stand in for universal concepts, it is more likely Representational, a step further in subordination. 6)Representational: The narrative stands in for some abstract concept such as philosophy, sociological perspective/condition, or universalized concept of humanity. Rule system: The narrative may follow essentially the same rules as the Realistic level but applied universally or at least broadly to a sociological condition, or it may follow the rules or principles of a particular philosophy without necessarily making an endpoint argument. Subordination: Both real and non-real elements are subordinated to universal/philosophical concepts. Analytical strategy: As most criticism hovers in this or the Rhetorical level, analytical strategies are well-established elsewhere. In brief: When considering narrative analysis, this and the Rhetorical level are too often considered the only relevant levels or the levels with the greatest capacity to highlight the value of a narrative – this is the limited perspective I’m attempting to correct. The concept is that a narrative has value in that it “means” something or is “about” something when this perspective separates, by several levels of subordination, the narrative from its core aesthetic value. The Representational level essentially bridges the Realistic and Rhetorical level in that realistic elements are elevated into the abstract realm by being treated as representations of universal conditions (humans aren’t humans but stand in for all of humanity, for example) or reflect one of thousands of possible philosophical perspectives without necessarily making an argument (which would qualify it as Rhetorical). The various philosophies are well-established within criticism, so I need not spend much time explaining them, but an example might be a Marxist perspective which views elements within a text as representations of class oppression, commodification, historical cycles of revolution, etc. Characters aren’t people but social forces and conditions and only have value in their capacity to represent. 7)Rhetorical: A catch all term for anything with an endpoint value based in some abstract concept, argument, lesson, etc. Rule system: The narrative must consistently follow the principles of the argument or lesson. Subordination: Elements within the narrative are subordinate to the argument or lesson. Analytical strategy: As most criticism hovers in this or the Representational level, analytical strategies are well-established elsewhere. In brief: I call this level “Rhetorical” for the sake of the catchy three R’s of rational-level narrative subordination, but this includes many types of narratives beyond the argumentative – didactic narratives, for example. The significance is that the narrative has a purpose or that the narrative is leading to a particular end. This endpoint may be open to interpretation, but the writer is proposing some rhetorical premise subject to the rules of rhetoric or a moral principle subject to the rules or designed to develop or disseminate that particular moral principle. It differs from the Representational level only in that a Representational narrative can function more purely as a portrait of an abstract or universalized concept, but the Rhetorical level further subordinates that portrait to the ultimate purpose, argument, lesson, etc.